India will continue to heavily depend on plastics in the next five years, says a report from GlobalData. The country is currently the world’s third largest consumer of polymers, behind China and the US, with a share of 5.7% of the 2011 global total – an increase from its 2000 size of 3.5%. According to the report, manufacture of polymer products will reach 11.575 million tonnes/year by 2016, a 9.4% CAGR from the 7.377 million tonnes/year in 2011. The report also shows that polymer demand is outstripping the country’s GDP growth. From 2000-2011, India’s GDP climbed at a 7.6% CAGR whereas polymer consumption grew at a CAGR of 9.1%. As plastics continue to create inroads into more applications such as agriculture, it is said that the industry can help address the country’s food problems. Plasticulture, a process that involves the use of plastics in agriculture and horticulture, is gaining popularity in India. In particular, micro-irrigation, which strategically places small devices that deliver water to specific soil locations. An effective device for areas with water shortage, micro-irrigation reduces water consumption by as much as 70%. With the help of the government, widespread use of micro-irrigation is expected to happen. The Micro-Irrigation Scheme (MIS) to date has brought 1.79 million ha under micro-irrigation at an estimated costs of US450 million. 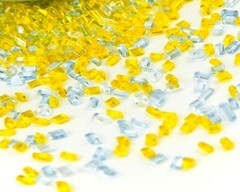 By 2017, 10 million ha of land will have these devices, which will spark the demand for polymers.